Distillation is the production of pure water from sea water by evaporation and re-condensing. Distilled water is produced as a result of evaporating sea water either by a boiling or a flash process. This evaporation enables the reduction of the 32000 parts per million of dissolved solids in sea water down to the one or two present in distilled water. The machine used is called an 'evaporator', although the word 'distiller' is also used. Sea water is boiled using energy from a heating coil, and by reducing the pressure in the evaporator shell, boiling can take place at about 60°C. The sea water from the ship's services is first circulated through the condenser and then part of the outlet is provided as feed to the evaporation chamber . Hot diesel engine jacket water or steam is passed through the heater nest and, because of the reduced pressure in the chamber, the sea water boils. The steam produced rises and passes through a water separator or demister which prevents water droplets passing through. In the condensing section the steam becomes pure water, which is drawn off by a distillate pump. The sea water feed is regulated by a flow controller and about half the feed is evaporated. The remainder constantly overflows a weir and carries away the extra salty water or brine. A combined brine and air ejector draws out the air and brine from the evaporator. Flash evaporation is the result of a liquid containing a reasonable amount of sensible heat at a particular pressure being admitted to a chamber at a lower pressure. The liquid immediately changes into steam, i.e. it flashes, without boiling taking place. The sensible heat content, water pressure and chamber pressure are designed to provide a desired rate of evaporation. More than one stage of evaporation can take place by admitting the liquid into chambers with progressively lower pressures. 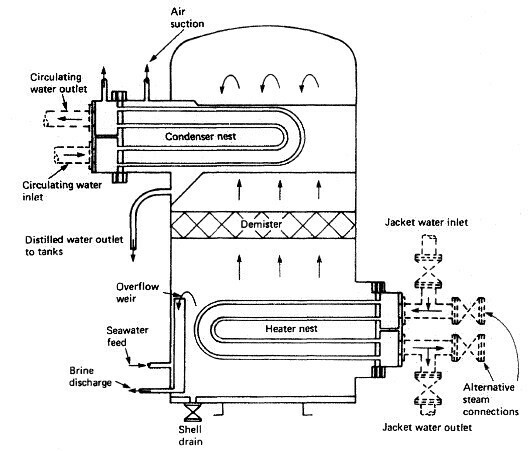 A two-stage flash evaporator is shown in Figure . The feed pump circulates sea water through the vapour condensers and the preheater. The heated sea water then passes to the first-stage flash chamber where some of it flashes off. A demister removes any water droplets from the steam as it rises and is then condensed in the first-stage condenser. The heated sea water passes to the second-stage flash chamber, which is at a lower pressure, and more water flashes off. This steam is demisted and condensed and, together with the distilled water from the first-stage, is drawn off by the distillate pump. The concentrated sea water or brine remaining in the second-stage flash chamber is drawn off by the brine pump. The preheater uses steam to heat the sea water and most of the latent heat from the flash steam is returned to the sea water passing through the condensers. An air ejector is used to maintain the low pressure in the chambers and to remove any gases released from the sea water. During the operation of evaporating plants, scale will form on the heating surfaces. The rate of scale formation will depend upon the operating temperature, the flow rate and density of the brine. Scale formation will result in greater requirements for heating to produce the rated quantities of distilled water or a fall-off in production for a fixed heating supply. Cold shocking, the alternate rapid heating and cooling of the tube surfaces, for a boiling process type, can reduce scale build-up. Ultimately, however, the plant must be shut down and the scale removed either by chemical treatment or manual cleaning. The working density of evaporators should not be allowed to rise above the manufacturer’s recommendation. Feed water regulators and brine ejection equipment must be kept in good working order. When the evaporator is in use it must be treated with the selected scale retarding chemical. The treatment is to be continuous rather than in "slug" form and is to conform to the supplier’s dosage rates.